#MCN2015 recap: What does ‘digital’ mean to you? Jennifer Foley, Director of Interpretation, Cleveland Museum of Art, Jeffrey Inscho, Innovation Studio, Carnegie Museums of Pittsburgh, and I ran a session called “‘Content’ and its discontents” which investigated questions and issues around the language we use when communicating our work. The panel also examined why talking through the semantics of what we do is more than just semantics, but has real impact on the meaningful subject matter museums create. Specifically, we looked at three rampant buzzwords; content, engagement, and digital. 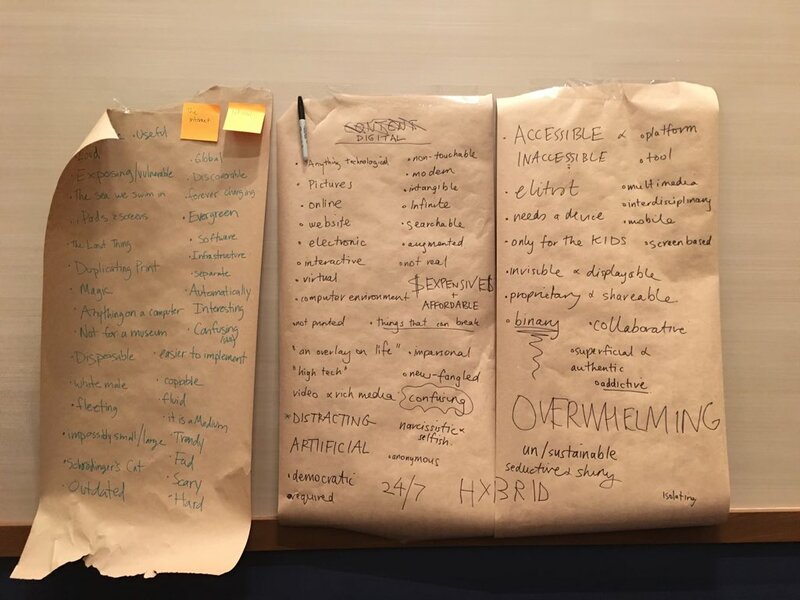 Given my obvious fixation on the word “digital”, I led the breakouts on coming up with answers to the question, “What does ‘digital’ mean to you?” The 40-odd museum professionals at the session generated a ton of answers and engendered some great conversation. The results covered several sheets of butcher’s paper, and we promised we’d get them typed up and posted for participants to see. Thanks to my intern, the marvelous Meike Gourley, the ‘digital’ sheets are transcribed and legible. It’s also worth looking at the results of Jeff’s “content” group, and Jennifer’s “engagement” group, to see how differently the three words resonated with people who use them all the time. Discussion follows the list below. Well, a lot, it seems! It was fascinating to see how schizophrenic and polarizing the answers to the question were. The number of answers that contradicted other answers is pretty telling. It will be interesting to see how it stacks up against “content” and “engagement”. What things strike you about this list? UPDATE: Here’s Jennifer’s take on the session and “engagement”. Go read it! I was thinking, while in the session, that all of the contradictions and extreme overloading of the term “digital” seems very human to me. I’m starting to think that’s all it really is, just a wrapper for all of the human problems/challenges/triumphs that we associate with rapid technological change. We just don’t have another word for it, this thing we’re all being forced to become. The first thing that strikes me is that the Complimentary list of words is a little bit longer than the Pejorative list. That says something! Digital tools are just that – tools – and it all depends on how we use them and what our goals are.